Here is a Winnie the Pooh baby girl diaper cake that is loaded with a little bit of everything! Angel put all of her time, creativity and love into making this diaper cake and it turned out so FUN! Her use of color and embellishments give her cake so much LIFE! 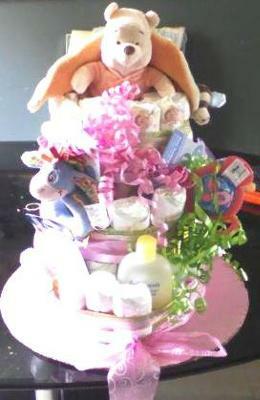 Angel, thanks for your CUTE diaper cake and your helpful 'recipe' - such an inspiration! Since my friend was having a baby girl, and her motif was all Pooh stuff, I decided to make a diaper cake for her that she would never forget. -I added baby soap, a Winnie the Pooh plush for the top, a Eyeore rattle, a Pooh/Piglet teething ring, some soothers and a tube of zinc. It took me a week but she LOVED it and it was worth every minute of it lol! Great cake design for this Pooh Baby Girl Diaper Cake. its so lovely in its look and the way you make it.